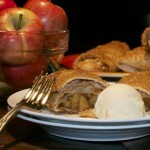 Caramel Apple Burritos -What the "Forks" for Dinner? Caramel Apple Burritos -What the "Forks" for Dinner? In a small skillet over medium heat melt butter. Add chopped apples, cinnamon and brown sugar and 1/4 cup water and let cook on medium heat for about 4 minutes. Stir together cornstarch and remaining 1/4 cup water. Add mixture to skillet and continue cooking until most of the liquid is gone and apples are soft. Mix together sugar and cinnamon. Melt 1/4 cup butter. Warm the tortillas in the microwave for about 1 minute so they are easier to roll. Divide the apple mixture and caramel bits between the tortillas. Roll like you would a burrito, folding in the sides, making a nice package. Brush each burrito with butter and roll in cinnamon sugar mixture. Place seam side down on a parchment lined baking sheet. Bake in a 375* oven for 15-20 minutes or until tortilla begins to brown. Enjoy with ice cream or whipped topping.